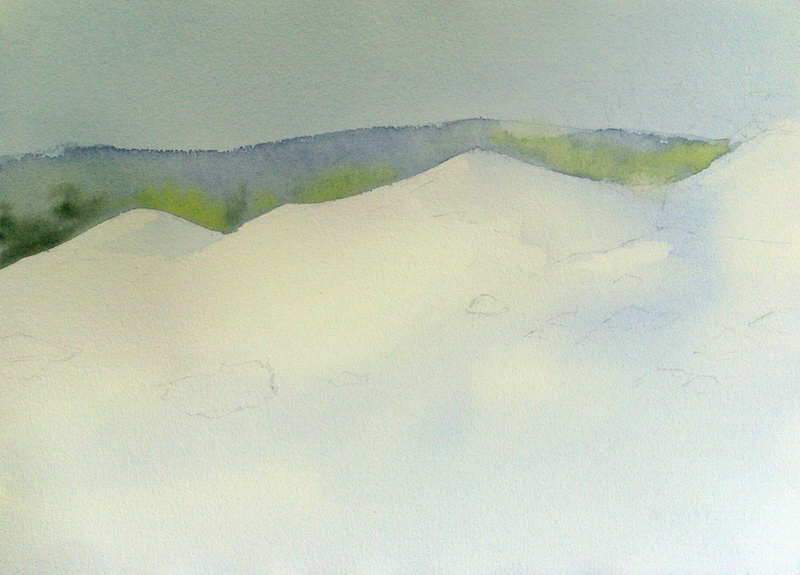 Now create a slightly dull blue grey mix of paint for the distant hill behind the sand dunes. I used French Ultramarine, a touch of Alizarin Crimson and a little Raw Umber to dull the mix a bit. Paint the hill and while it is wet drop in the blue green color on the left hand side, do this wet on wet – this represents the distant trees or shrubs which you can see in the photograph. Also, while the hills are still wet drop in some Aureolin as shown to act as a background highlight for when the foreground shrubs are put in.